Approximately fifty-six million years ago, the oceans underwent a period of warming and acidification during the Paleocene-Eocene Thermal Maximum (PETM). A recent investigation of how ancient coral communities responded to the PETM may provide clues as to how modern corals will survive similar changes. 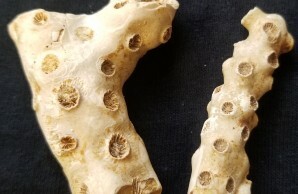 Using data compiled through the Paleobiology Database, a public database of nearly 1.4 million fossils, paleontologists Anna Weiss and Rowan Martindale at the University of Texas at Austin reviewed and verified the fossil records of scleractinian, or “stony,” corals from the Paleocene and Eocene stages. They identified a variety of traits associated with coral genera, such as preferred foods, reproductive strategies, the presence of symbiotic algae, and the ability to share resources with one another in a colony. A bio-statistical analysis was used to determine which traits were linked to survival. The researchers found no change in genus diversity following the PETM, though there were some extinctions that occurred at the species level. Some coral populations, however, fared better than others. Corals that were carnivorous, had suspension feeding diets, or were hermaphroditic survived in greater numbers, and there was an increase in the proportion of solitary corals and those living in habitats with silica-based substrates (similar to those currently found in the Gulf of Mexico). In contrast, corals that depend on symbiotic algae for food were less likely to survive. These are the corals that build reefs, “like those found in the Turks and Caicos Platform, or the Great Barrier Reef,” says Weiss, adding that their loss would cause “a major ecosystem shift.” Coral reefs create keystone habitats responsible for everything from nutrient cycling and carbon/nitrogen fixing to providing shelter and food for many organisms.